Volunteers play an important role in the successful completion of our mission. There are a variety of opportunities at the Chesapeake & Ohio Historical Society Archives and The C&O Railway Heritage Center. Some activities are available for those who enjoy working at a specific event while others are for those who appreciate a weekly scheduled project or have larger amounts of time they would like to spend at the Society. Below is a list of available volunteer opportunities at the Chesapeake & Ohio Historical Society and Heritage Center. The activities listed are general and not a comprehensive directory of everything that we have to offer. Please contact the Volunteer Manager for current opportunities or if you would like to share a special skill with the Society. 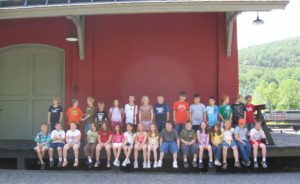 Education − Education comprises many things at the Chesapeake & Ohio Historical Society, including tours, outreach and school programs, and special family programming. All require an enjoyment of children of all ages, and usually, only an hour or two of your time. Outreach Programs − These are special one to two hour programs that are brought to the classroom. They include an interactive talk and use many hands-on activities and props. School Programs − The Society offers various school programs dealing with specific historical topics. These are often collections or exhibit based, and the guide has the opportunity to interact with the students as they lead them through activities. Special Programming − Evenings and weekends are opportunities for the Society to offer unique programming for family audiences. These programs may include lectures, activities, movies, and other interactive elements. Such programming requires extra people to supervise and help during the event, and occasionally doing some preparation before it. Tours − Groups visiting the Archives are offered guided tours as part of the price of admission. Tours are about 50 minutes long and are often accompanied by a train ride. During certain times of the year, the Society needs several guides each day to accommodate groups of adults and children. Restoration & Maintenance − We continually need to care for our locomotives and rolling stock. If you like working with your hands and have an interest in restoration, the Society can use your help restoring rolling stock or creating a special project. Grounds Crew − Volunteers may work with the maintenance staff to cut grass, weed, water flower beds, and, other gardening tasks. This activity can be scheduled on a regular basis for both groups and individuals or once a year during larger grounds projects. Library & Archives − Although two percent of what the Society owns is on display at one time, the Curator must account and care for everything else. The remaining collection is in storage and needs to be cleaned, repaired and catalogued. The Curator would like help with various inventories, sorting, and cataloging projects. These jobs are best for those who like to work independently or with a partner, and are willing to schedule their time regularly during the week.We have regularly scheduled work sessions that allow teams of volunteers to work on large projects. 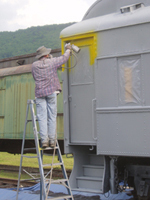 This provides a good way for you to learn about the Society’s organization, and to delve deeply into the historical archives where the fine details about the C&O Railway’s history are waiting to be revealed. Museum Store − The Depot is a wonderful place to interact with the public while working in a relaxed environment. Individuals are needed to help in daily operations and during special events. These events require several individuals to operate the store and outdoor sales venues. Office Assistance − On-call office help is needed for larger projects such as stuffing envelopes and opening mail. Photography − The Chesapeake & Ohio Historical Society always needs photographs of people, events, trains, and other objects for use in publicity and for its newsletters and website. If you would like to develop your photography skills while donating your time and prints or digital images, we would be grateful for your help. Special Events − The Chesapeake & Ohio Historical Society hosts several special events a year. These often draw large numbers of people and demand many volunteers to make the event successful. If your schedule does not match our organized work sessions, there are any number of tasks that you can help with on an individual basis. Some of them require a visit to our Archives, but we also have volunteers doing work from their home. The ways you can help as a volunteer varies throughout the year, so contact us for information.